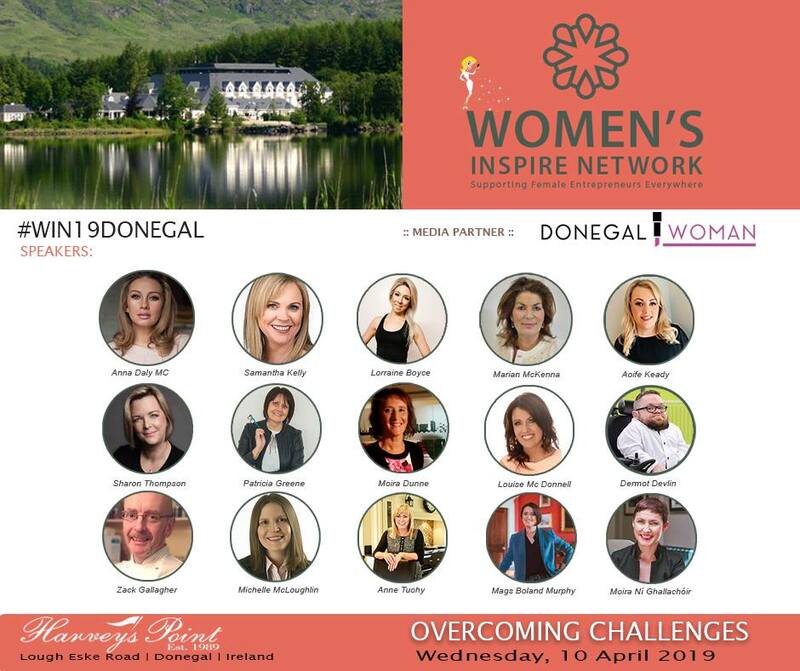 I am delighted to be a sponsor and speaker in the upcoming Women’s Inspire Network spring event at Harveys Point in Donegal Town on Wed 10th April! I will be speaking about how to get more leads, sales and enquiries and ultimately more profit from your website. There is a fab line up of inspirational speakers who will be sharing their experience, their knowledge and insights with over 100 women who are there to learn & network. The theme is ‘Overcoming Challenges’ as an Entrepreneur. So who is in the line up? Meet Ireland’s answer to Holly Willoughby, Anna Daly who will be our MC and speaking about life in television at the event. Making the decision to change your career path and not looking back! – Live TV: the best training ground for any TV presenter. – The career highs and the people that impressed her the most. – Who’s best suited to a career in telly? – What the producers want to see when you pitch an idea. – Anna’s latest project, her own lifestyle website annadaly.comand why it’s important for her to develop other projects. Aoife Keady has shown entrepreneurial traits from a young age but didn’t get to fully act on them until she was 19 when she leased a café. She loves a challenge so in her final year in NUIG she went on to lease that same café along with the pub and B&B attached. She often says if she got a Euro for every time someone said ‘I would’ve gone if I’d known it was on’ about an event in her community she’d be a millionaire. That’s how her recent venture ‘What’s Where’ was born. Anne Tuohy – Believe in yourself, and ditch the self-doubt for good. Awarding winning Interior Designer Anne Tuohy absolutely believes in the positive benefits of living in a home that is professionally designed, which is as functional as it is beautiful. She works personally and passionately with her clients to ensure that together, they achieve their perfect home. Anne’s mantra is “perfect homes not perfect houses”. Every design project is a unique collaboration, she gets to know you deeply, and delivers the home or workplace that is right for you, and unique to you. An amazing personal journey of function and design. Anne’s other passion is teaching, and she travels countrywide, bringing her hugely popular Sharing the Secrets Masterclass to homeowners everywhere. This is where she inspires great design and shares her personal design secrets so that her students can consistently create the perfect home for themselves. With her guidance, every home will be transformed, and every life improved. In today’s hectic world being productive is about making good decisions, managing your attention and using technology smartly. Louise McDonnell – Tap into the power of Facebook and Instagram Ads to build brand awareness and drive sales. The Facebook Ads Platform is possibly the most powerful tool available to brands today. Businesses can target customers and potential customers using demographics, psychographics and through the way they interact with them online. Even businesses with a limited budget can use sophisticated remarketing techniques to drive sales. But must businesses are only scraping the surface…..
Mags Boland Murphy- Valuing your time – How to get the right price for your business service. Lorraine Boyce – The Big Taboo… Let’s Talk About That! ‘It’s possible to turn your website around from being a total disaster to bringing in new leads and new customers!’ Having worked in the web design business for almost 20 years, being chair of Northern Ireland’s business women’s network Women in Enterprise for almost 4 years, and as a digital marketing mentor across several business programmes, Patricia Greene of Nolka Web & Digital Marketing has a very clear understanding of the struggles which female entrepreneurs face daily. She has created ‘The Web Club’ to provide advice, support and encouragement for women struggling to get enquiries, sales or leads from their website and her work with them has proven to bring a transformation in their business. BOOK HERE using my discount code patricia for €20 off the cost!